An artists impression of the Neolithic site. The Friends of Aden have launched a crowdfunding campaign to help raise £1,000 towards an archaeological dig and associated activities due to take place at the park from June 24 to July 7. It is hoped that the proposed dig will encourage local schools, groups and people to get involved with the history and heritage of their local community. In November 2018, an archaeological dig supported through the Aden Country Park Restoration and Redevelopment Heritage Lottery Fund (HLF) and the Aden Archaeology Historic Environment Scotland (HES) project, took place revealing an enclosed structure potentially dating back to the Neolithic period, possibly 5500 years old. This exciting, extremely rare discovery has resulted in the need to carry out a further excavation of the site, which will hopefully uncover more of the history and confirm the layout of the possible Neolithic structure. 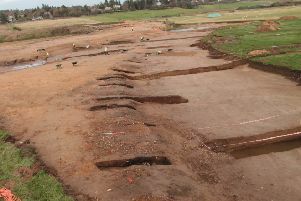 Archaeologist, Ali Cameron, who has been commissioned by Aberdeenshire Council to lead on archaeology aspects of the project said: “The digging team and I were so excited when we discovered that the structure was much larger, and potentially much earlier than we had thought. “It is an intriguing enclosure with both posts and living trees and must have been very prominent in the landscape. The crowdfunding will also help fund two archaeology open days which are to be held on June 30 and July 6. The open days will provide visitors with a real insight into Neolithic life including traditional crafts, diet and early forms of music. “The dig and open days will be free for the public to attend and it is hoped that they will encourage people of all ages to engage with archaeology and their local heritage. The Just Giving crowdfunding page is now live at https://www.justgiving.com/crowdfunding/archaeologyataden?utm_term=rDQB97BMY or visit the Aden Country Park FB page which explains how to donate.